It's already the end of August and the nights are getting cooler. Luckily, my latest robotics project is keeping me busy during these shortening evenings. 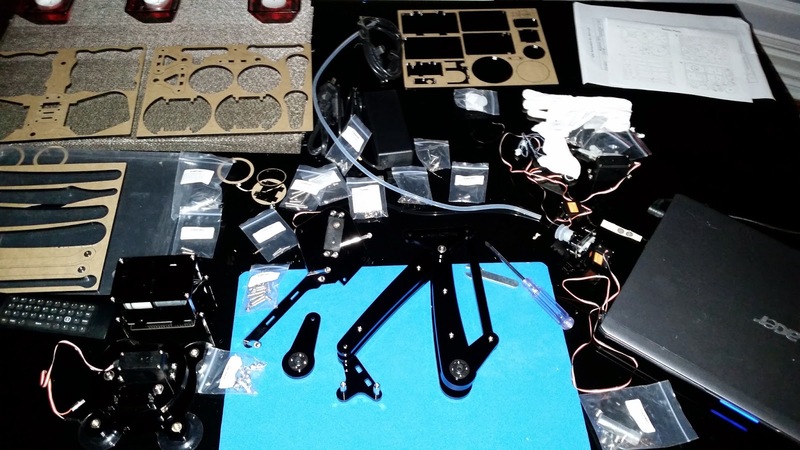 I ordered a couple assembled uArm kits from UFactory a few months ago with their latest manufacturing run ready in time for the summer. To my surprise, I received an email from one of the sales reps who offered to send me four unassembled kits instead of the the two assembled arms. I figured that this is a great opportunity to learn about the engineering of the arms and decided to jump right in. uArm was the result of a very successful Kickstarter funding campaign. Similar to the Makeblock team, it looks like the Chinese company was founded with the approach of using Kickstarter to fund their initial product line. A uArm is an fully open source hardware and software platform that brings robotics to the masses. I had been looking for a good robotic arm for experiments and found that arms with comparable robustness, precision and accuracy tend to run a couple hundred dollars more per unit so this $299, it's not a bad deal. The unboxing was pretty straightforward which was to be expected. The acrylic parts were easy to remove from their sheets and the hardware (screws, bolts, etc. ), were usually well labelled. The pdf instructions were also easy to follow. I have to admit, it was a little frustrating screwing in the tapping screws from the servo horns to the acrylic. Metal horns would be a better fit with the metal gear and precision cut acrylic. This isn't enough for me to say that the kits aren't great. Although it took me a few hours to assemble my first arm, the second one was much easier as I knew what to expect with each step. I ended up building one arm with the vacuum pump end effector and one with a claw. Turning on the connected uArm Arduino board for the first time, there was a large consistent tone from the buzzer. This is normal. It stopped once my initial program was loaded. Using Ubuntu, it was pretty easy to get the uArm libraries installed and get the initial calibration software installed. Unfortunately, one of my arms had defective software but after calling customer support, they assured me that they would send replacement servos. 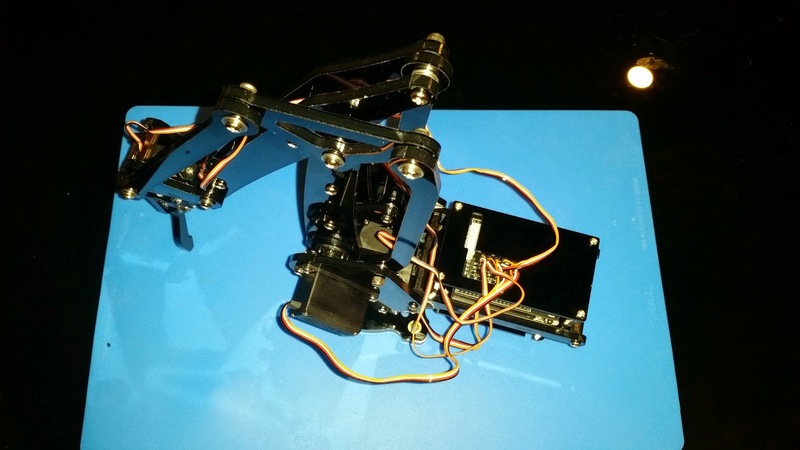 After building the second arm, it wasn't too difficult to find out how to swap the main servos out. The servos have the potentiometer wire already integrated, so feedback is possible to be read from the board. This is quite important for more advanced uses. True to their open source hardware and software company policy, UFactory publishes all of their schematics and code. This helps cultivate the community and some people have improved upon the initial code,. For example, for the calibration step, Scott Grey has thankfully release his version that helps prevent the arm from damaging the servos during the initial setup. I hope the software continues to improve, especially from uFactory's branch. The arms have a lot of untapped potential which makes them great for robotics, to support those who enjoy the weekend hobby to university/research alike.